Bring a new visitor to the Spa this Fall and SAVE MONEY! 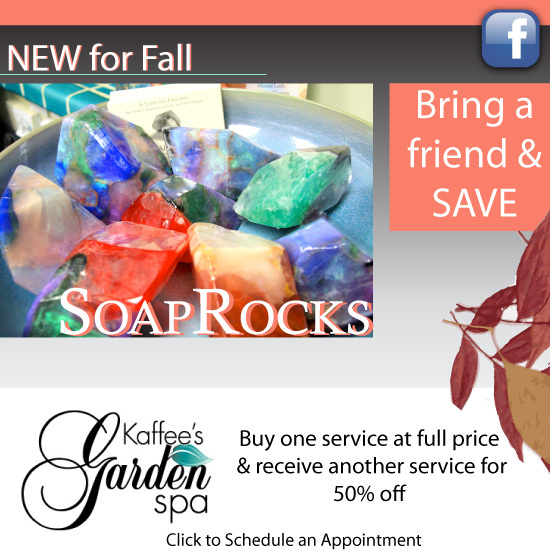 Introduce a friend to Kaffee’s Garden Spa from now until November 30th and you can save 50% on any treatment over $50 value. Just choose a full price treatment for yourself and your friend’s treatment, of equal or lesser value, will be 1/2 off. Be sure to schedule your appointment before 11/30/2010. You can schedule by calling Kaffee’s Garden Spa at 561-833-4483 or email kaffee@kaffeesgardenspa.com. To qualify for this offer you must bring a friend (relatives included!) who has never been to the Spa before and the discount cannot be combined with any other offer. Soap Rocks are the latest craze at the Spa this Fall. These beautiful gems are sure to energize your bathing experience by offering so much more than just looks. Soap Rocks have all natural vitamins and minerals like Aloe, Vitamin E, Jojoba Oil, Olive Oil, and Almond Oil all within a smooth colorfully shaped stone bar. Be sure to ask about them at Kaffee’s Garden Spa!